Disney Frozen, the movie, fabrics featuring Elsa, Anna, Olaf, and Kristoff are for great for quilting, apparel, craft and decorating projects. Frozen Snowman Olaf Forest Cotton Fabric features Disney Frozen's Olaf in different positions tossed.. Frozen Snowman Olaf fabric features Disney Frozen's Olaf in different positions tossed on a backgrou..
Disney Frozen book cotton panel makes a books that features Elsa, Anna Olaf, Kristoff and Sven in a .. 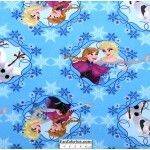 Frozen Characters in Snow cotton fabric features Elsa, Anna Olaf, Kristoff and Sven in assorted grou..
Disney Frozen Elsa and Anna Glitter cotton fabric features Elsa and Anna emerging from scroll frames.. Frozen Elsa Badge Toss fabric features Elsa in circles, tossed with snowflakes on a cold winter look..
Disney Frozen Olaf fabric features Olaf with big smiles tossed with his name in large blue capital l.. 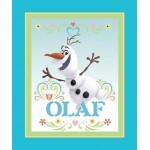 Frozen Snowman Olaf fabric features Olaf playing tossed with icons and words of the of Christmas on .. 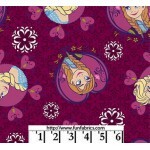 Frozen Ice Skating Sisters Cotton Fabric.. Frozen Movie fleece licensed by Disney. This fabric is 60" wide polyester fleece fabric, priced per ..
Disney Frozen Fabric, Frozen Olaf Cotton Cotton Panel, Fabrics for quilting, sewing, craft, and home..
Disney Frozen Fabric Collection, Frozen Olaf Dancing Cotton Panel, Great for quilting, sewing, craft.. Frozen Sisters Forever cotton fabric features Disney sisters Elsa and Anna tossed with the words "Si..
Disney Frozen fabrics are licensed by Disney. This fabric is a 44" wide flannel print..
Disney Frozen Sisters Ice Dance Glitter fabric features Elsa and Anna skating with Olaf on a rich pu.. Frozen Sisters Ice Skating Badge Fleece This fabric is great for no-sew blankets.. Frozen Sisters Ice Skating Blue Cotton Fabric..
Disney Frozen Sisters Skating Glitter fabric features Elsa and Anna skating with Olaf on a wispy blu.. Frozen Sisters Skating Snow Flake Flannel, Fabrics for quilting, sewing and craft projects.. 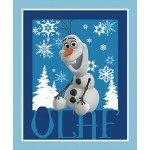 Frozen Snowman Olaf fabric features Olaf in different positions tossed on a background of dark blue,..